and other extensive consultation we have referred local residents, businesses and others to the planning application and that itself contains full and accurate information on all aspects of the project. Our own blog is intended to be a gateway in that regard. 1 The colour used is unrepresentative of the colours actually proposed in the application and does not properly reflect the variety of materials, details, tones, modelling and reflectances envisaged. 2 The height drawn in the montage exceeds that in the accurate repesentations submitted with the application, some of which are in our own blog. There is a wider selection on the council website. 3 The building drawn in the montage appears to have a rather alarming lean of approximately 4 degrees towards Falcon Road which again is not a feature of the actual proposal. The montage thus projects a rather “crowding and toppling” effect which is certainly not proposed, and which we ourselves as designers would have considered totally inappropriate. Inaccurate representation of the proposal for whatever reason is unacceptable and should not form a part of any informed debate. In essence the montage is unrepresentative of the proposal and should be discounted. 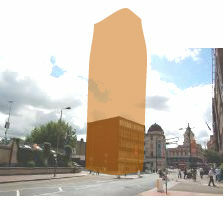 We note that you have described your Post as “New Hotel Tower in Clapham Junction”. Whilst we acknowledge that the proposed building is of 16 stories we have carefully considered the setting and give a detailed design and planning rationale in the Design and Access Statement and other documents submitted with the application. It should be borne in mind that our proposed building is in fact no taller than some existing and consented buildings in the area and some 26 stories lower than those recently proposed for the Clapham Junction Station Site. It should also be noted that the site at 155 Falcon Road is the lowest within the immediate town centre. The setting of the proposed hotel building within the town centre and within the existing and any future likely backdrop has been a fundamental part of consideration of the design and is again covered in detail in the Design and Access Statement. Regrettably it must therefore be concluded that if as you say the montage is intended to give “an idea of the consequences” of the proposal it comprehensively fails in that regard. as well as with the council application. My previously posted comments on the gross misrepresentation of the first image provided by your website has been met with your instant alteration of the profile of the building, thus acknowledging the deficiency of your earlier post, although your new images are still wrong. Other legitimate points about the proposed building’s colour, detail and other features being incorrectly shown on your blog’s images remain. Clearly there has never been any intention to deliver a building of the alarming hues of your latest illustrations, which seem to display a wildly imaginative streak. The planning application for the hotel is concerned with a well researched project to remove an unsatisfactory existing building with a stylish new one, and, at the same time through investment to drive regeneration, economic vitality and employment in an area that needs it. By all means let’s have a debate, but base it on accuracy not misrepresentation or fantasy. architecturerosemont> I am sure that your own website will give several pages of sketches and explanations, as well as attracting a wide debate with extensive justifications. Nevertheless in order to contribute modestly to it, I have decided to publicise here a few information. I welcome your comment on this article. However I did not expect to have to correct your points so quickly. I thought that the English word for the building was “tower”. I may be wrong, so I am always happy to learn. Is your proposal a low Edwardian or Victorian construction? All in all, I think you should engage with a constructive dialogue with the local resident of Clapham Junction… but of course it it just my personal advice. Some other developers in the past found it was not worth it… we now what happened. Whilst I have a downloaded copy of your first “blobby” image could you please confirm that you have removed it from your site in view of its inaccuracy. architecturerosemont> I put it back, so you can take you time to save it. You are right, it is better not to mislead people in anyway and let them compare the total inaccuracy. The applicant has offered to meet you by invitation through the Love Clapham website and by hand delivery of a letter to your house in April 2008 and again last week. His offer remains open. I can facilitate this any time you wish; please let us know when this will be convenient. We have given before details of the consultation already done and submitted to the council a Statement of Community Involvement. This is freely available from the council, as it is a planning application requirement. I personally gave a presentation to The Clapham Junction Town Centre Partnership and attended two public exhibitions on site in April 2008 after neighbouring residents and businesses were hand delivered invitations to the events. To imply as you have done that there was no consultation is again just plain wrong. Having been the ten times elected chairman of a publicly funded and successful urban regeneration partnership the importance and value of public consultation is well known to me. I was not been invited not even aware of the Clapham Junction Town Centre Partnership presentation. I don’t know who to blame, so I won’t comment. I have noted you invitation. Unfortunately time is short and due to the Twin towers application, It is only today that I found time to report on the hotel proposal. However I will let you know as soon as we could arrange something. We have already done a consultation going back 18 months or more and based the designs on those consultations. The application is in and the time for comments is set down. To be meaningful any futher meeting should be sooner rather than later. The meeting that is on offer is on an individual basis and the agenda needs to be agreed in advance. architecturerosemont>Thanks, I appreciate. However you must know I’m not an architect nor a town planner in the borough, therefore must do a few other things for living. I’m afraid that I just do not understand the blanket objection to tall buildings in Battersea. Surely if a building is tall but is well designed that is better than most of the dross built at mid height in the 60s and 70s. In my view this proposal is quite an improvement on the site and if it causes a precedent that allows well designed tall building in the Clapham Junction area – good. andrew paul healey> This is not a blanket objection. Many residents chose to live in Clapham/Battersea rather than Croydon or Canary Wharf because they love the village atmosphere, Northcote Road, the Victorian and Edwardian streets and we want to preserve this specific character. We are currently working with other volunteers to help define better guidelines on what is an acceptable development for the area. We do not dismiss towers, but are considering them within the immediate vicinity. An infill scheme on St John’s Hill, which retains on the south side the principal character of the Conservation Area, is one thing, although there is considerable diversity including a more modern building there too. Falcon Road north of the St John’s Hill, St John’s Road, Lavender Hill junction just doesn’t have any of the characteristics of the best part of the Conservation Area, neither does most of the station site. The whole of Falcon Road north of The Falcon on the west and Mossbury Road on the east is crying out for improvement and investment which ultimately may include the Asda, Boots and Lidl sites. These areas should not be set in aspic, but are a fundamental part of the adopted regeneration strategy of Clapham Junction town centre. This particular part of the Conservation Area has been identified as one where development may be expected. To see something more in the future than the very basic and boring buildings currently on these sites requires vision, committment and investment. Whilst the involvent of residents and local businesses in a local strategy is of course to be welcomed, the Clapham Junction Town Centre Partnership, comprising a range of local interests, already exists and that organisation has been involved from inception with development of local policies. I would just like to say that this proposal looks great. I have already submitted to the council my view that this area desperately needs a hotel, and so am so glad to see this come forward;- a deliverable scheme to kick-start economic regeneration of Clapham Junction Town Centre. I appreciate this information might be available in your application, but I would love to have the opportunity to understand in more detail how you intend to improve the environment outside the development for pedestrians and cyclists (since I understand you will be supplying no parking at all?). are your proposals linked in with the councils plans for redesigning the traffic junction to become pedestrian friendly? Without this, I fear your development will not bring as much benefit as it could to the retail and leisure to the northern side of Lavender Hill. I also want to know if you will be actively promoting the improvement to the quality of the environment for pedestirans underneath the rail bridge, following similar improvements as achieved through the ‘Light at the End of the Tunnel’ initiatives at Waterloo. Si Ho> I acknowledge your comment and appreciate that it is consistent with our previous discussion. Bear in mind that I am not against a hotel, and I would actually like to encourage business and considerate development around Clapham Junction. However I consider that towers are not the obligatory answer to regeneration; I have also issues on the way a hotel of this size will be working on Falcon Road, as I very well know the state of the traffic. Your comments make additional concerns actually on the benefits it will bring to the Town Centre. When I think of the Wessex House redevelopment, or recently of the Nine Elms proposal (after initial plans from developers was pulled down), I remain certain that architecture and town planning can work together for the best of the residents. Do we want Wimbledon or Kingston Town centre In Clapham Junction? I have heard nothing about this proposed hotel untill today & I try to keep an eye out on what is going on in the area. Si Ho raises interesting points about possible improvements to the public domain and transport in the town centre. The hotel itself will be a relatively small part of the town centre, although it is possibly the first deliverable sign that regeneration of the town centre is going to be real not just a utopian’s dream. For whatever reason the station project is at least delayed. The council’s “Exemplar” scheme for traffic and pedestrians in the area is only partially funded and further funding was seen as dependent on other contributions presumably from future projects or other public funding. If they are delayed, no funding, so the Council and others may have to reconsider their plans or at least the programme. Clearly public funding of projects is under close review given the financial crisis. How could one not agree that certain parts of the town centre are dingy and unworthy of a “town centre fit for the twentyfirst century”? As a former resident of the Junction and somebody exceptionally familiar with the patch, the road tunnel under the railway is surely the apogee of unpleasantness. Roaring noise of buses, pigeon filth and nasty lighting all combine to make this a truly horrid and frightening space. Yes lighting and possibly some sort of constantly changing art presentation using apparently plentiful local artistic talent based on technology spring to mind. Bring art to the streets by all means. Funding of this will be difficult to find however, but the Town Centre Partnership as a body has the power to apply for funding of projects. In terms of the hotel the council’s website on the application gives full details of the proposal, including transport considerations. As you say it will be a car free scheme; there will be a cycle storage facility. Disabled access has been considered and is provided for to ensure inclusivity. Analysis by the traffic consultant determined that the proposal complies with all guidelines. Within the borough and assuming it gets built the project will provide the most green friendly hotel facility through its proximity to the station and other forms of public transport. Adopted policies anticipate that activities of this type will occur at transport hubs. 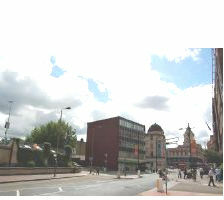 On public domain improvements we as designers were encouraged by the planning officers to improve the public domain and active frontage particularly to Falcon Road and Falcon Lane, as the site is seen as a pivotal one linking the existing main town centre to other areas capable of change and improvement in the future. Town centres are, after all, dynamic organisms. 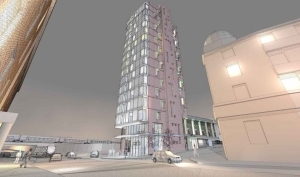 As a local resident who makes an effort to keep abreast of local developments, I am concerned that I have only just heard of this new hotel tower development at Clapham Junction. I live a couple of minutes walk from this site and I have not been involved in any consultation process. I too have some concerns about the scale of the building in relation to it’s surroundings, and the precedence this might set. It certainly doesn’t fit into the low rise surrounding residential and shopping structures. CJ and Northcote Road is extremely popular for it’s village feel, and the introduction of towers into this environment could be detrimental. I have checked the developers site and also do not find the renderings particularly clear, in terms of external covering, can you provide more detailed information as to the materials you plan to use, photos and or links to a website detailing the material would be useful. Full details of the consultation, which was extensive, have already been given and are available in the Design and Access Statement which has been registered with the council under main application 2009/1291. Consultation commenced in 2007, Coverage includes the web and local press. The council has advertised the application. 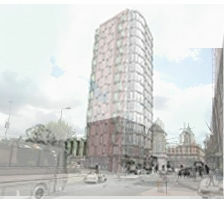 A presentation was made to the Clapham Junction Town Centre Partnership in November 2007, being a public and advertised meeting attended by representatives of the public and various local organisations. We draw your attention to the fact that the site is not in or near Northcote Road which is an entirely different sort of area. There are adopted council policies relating to taller buildings in certain parts of the town centre and where regeneration is encouraged, and the application site is within that part of the town centre. Our website is intended as a gateway only. Materials have been selected to be appropriate for the purpose of the building, its intended lifespan and in order to relate to the predominant materials and colours in the Conservation Area. Detailed choice of final materials will be done later and as is usually the case approval of those will be subject to separate later approval by the local authority. We suggest you visit the Town Hall to review the documents in their full size format as web versions are often less accurate than one would wish.